Upon our arrival in Hiva Oa, paradise, Marquesas, we needed to run our trusty Honda generator to make some water. The Honda started like normal. About an hour later we were both in the cabin when we heard the sound of death. A loud clunk followed by the sudden stop of the Honda generator. This didn’t sound good at all. I went up to the stern of Dazzler to inspect the Honda and tried to pull the starting cord. Nothing! In fact, the starting cord would only move about five inches and it was locked up hard. Before leaving Mexico, I would liked to have replaced the Honda with a new one. But, because we were bleeding money getting everything else ready to go, I settled to replacing the carburetor and several other electrical components of the Honda. Our Honda is just over twelve years old. We put out feelers for a possible replacement in Papeete, but no luck. We might have found one that was 240 volts 50 hertz, but that would not work for us. We were in a pickle, quandary, dilemma, but we were in paradise. Paradise has many things to behold, but a shinny new generator is not one of them. After a few weeks of traveling around the southern Marquesas islands, we made plans to travel to Nuka Hiva, one of the more northern islands. I had several friends working on providing me with info for a replacement Honda via the Iridium Go email system. Thank goodness for that communication and my friends providing the new model generator specifications. As it would happen, my 12 year old Honda is no longer in production and a newer model replaced it. With all the new information it looks like it is almost exactly the same size. And a bonus that it is 2200 watts instead of 2000 watts. Now that the replacement had been determined, I needed to work on buying one and figuring how to get it to us in Nuka Hiva. Once we arrived in Taiohae Bay in Nuka Hiva, I made contact with Kevin Ellis at Nuka Hiva Yacht Services. Kevin is the go to individual for importing and shipping into Nuka Hiva. I knew instantly that getting the generator here would need the services of a shipping agent to work on our behalf during the import process. Kevin you’re hired! We filled out a few documents that he scanned including one of my credit card information to pay the assorted customs and import fees when the generator arrives in French Polynesia, Papeete. Kevin also provided me with the exact instructions on how to address his business for the generator to arrive. He indicated that once an item is shipped it takes approximately two weeks until it arrives. Kevin’s fee for his shipping agent service was $40 USD. With that behind us, I found an internet company that sells generators located in Orange County, California. This wasn’t the cheapest company, but it was the one that could get it to our good friend Jack in the Los Angeles area. I purchased the generator and was having it shipped to Jack in Torrance, CA. He was already onboard with the shipping instructions for sending it to us. It seamed as if it was too easy. Trouble is coming more than you may know. Because my contact telephone was unavailable when the generator company tried to confirm my order with me, they canceled our order. They indicated that because it was being shipped to other than my billing address they needed to confirm the purchase. Because they could not contact me they cancelled he order. Our friend Jack was expecting to receive the generator in the next few days. I had provided him all the contact information for the generator company. He had called them to confirm when it would arrive. That is when he discovered the cancellation. He facilitated it to be re ordered and got it the following Monday. He dropped it off at his friend’s FedEx business and it was off to the races. We love you Jack! The shipping expense for economy air freight for a 55 pound box carrying a Honda Generator was almost as much as the price of the generator. I’ll say it again, nothing’s free in water world. Because of the spotty internet connections here on the island, Jilly used several family and friends to help us track the package. We know it traveled from LAX to Hawaii, then to New Zealand and the to Papeete. 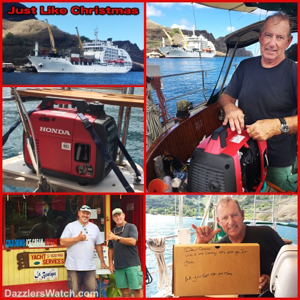 Once there Kevin was able to spring into action on our behalf as our shipping agent and bing bang boom, it was on the Aranui 5 cargo ship headed for Nuka Hiva and the anxiously awaiting crew on Dazzler. Monday morning when I saw the Aranui 5 enter the bay, I could hear the song from the Music Man, oh the Wells Fargo wagon is a coming…I’m hope it’s coming with something just for me. Sappy, but that’s the song that went off in my noodle. Jilly and I had gone into town to do some more provisioning and on our way back to petite quay, one of our friends said they saw a generator being off loaded at Yacht Services. Imagine my further excitement. But, we had some frozen food in our bags that needed to be put in the freezer. So, off to Dazzler we went to secure our provisions. I think it was one of our fastest turn around trips just like an Indianapolis raceway pit stop. Less than a minute. Then back to the dock and Yacht Services. Upon our arrival, we met Annabelle, Kevin’s wife, and she indicated that Kevin would be back shortly. So, we did the cruiser thing, walked by the generator outside and walked up to the Tematapuaua restaurant for a beer. The generator wasn’t going anywhere, so we did the sensible thing and went for a cold beer. On the way to the restaurant, we saw Kevin walking back to his shop. He said he had the new beast. We said we would be down after we have a cold beer. Make a plan, keep a plan. After we finished our beer, we walked back down to Yacht Services, where we settled up our fee with Kevin and picked up the new generator. Once back on Dazzler it was Christmas in May. Did I say, We love you Jack? Our friend Jack wanted to make sure the generator was properly packaged and so he used 19 large oil absorbent cloths to pad the inside of the box. Cardboard and oil pads were flying all over the place. You would have thought I just received the Red Rider BB gun. Adios Black Bart. It was beautiful. I welled up a bit and almost shed a tear. Not really. Before filling it with oil and gas, I took out all the screws holding the case together and the bolts holding on the feet and put TefGel on them and reinserted them onto the generator. I had read an article about doing that and or greasing them when the generator is used around the marine environment. I figured what the heck, it sounded like a good idea to me. The oil was filled as well as the gas. Start time in T minus 3, 2, 1…. Go! It’s so quiet. Our old generator was much louder. You could even have a conversation in the cockpit while the new one was running. For those of you chomping at the bit to ask the question what did you do with the old generator? Well I’ll tell you shoutie, I stripped all the new parts I had recently installed including the new carburetor and drained the oil and gas. While draining the oil, I found a 6mm bolt from the inside of the crankcase. I could only guess it was from the connector rod bearing and was the ultimate cause of the loud clunk. I asked Kevin what should I do with the old generator carcass. He asked if he could have it, so we gave it to him. The new generator has a new home on Dazzler and has been named Jackie with fondness toward our good friend Jack. The old generator has a new home with Kevin. No petroleum products were harmed or improperly used during this event. And everyone lived happily ever after. Shipping 1, 2, 3! That’s it from paradise. Did I mention how extremely quiet it is? People ask me “what would you do if your Honda 2000 died”.